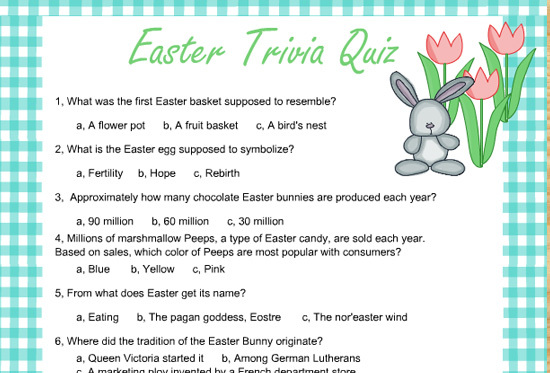 Today I have prepared this Free Printable Easter Trivia Quiz in three different designs. There are 12 fun Trivia questions in this quiz. 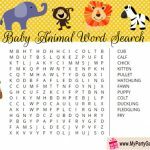 I am also sharing the answer key at the end of this page. 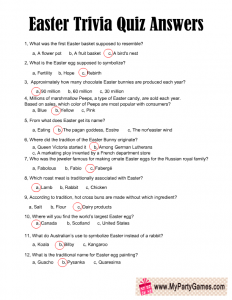 You can play this quiz in your classrooms and also in your Easter gatherings and parties. This will evaluate and increase the knowledge of the players. 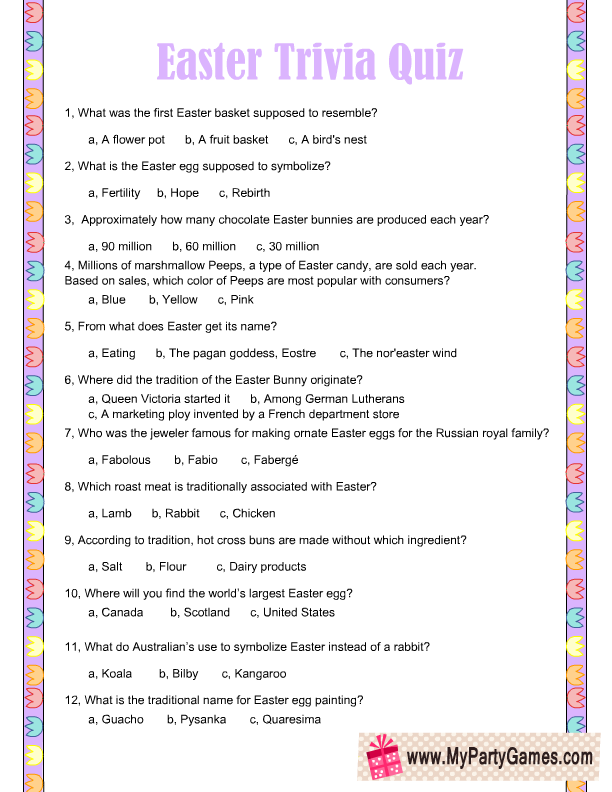 Print and distribute these Easter Trivia Quiz sheets among the players along with a pen or pencil. Ask the players to choose and circle the right answer among the options given below each question. 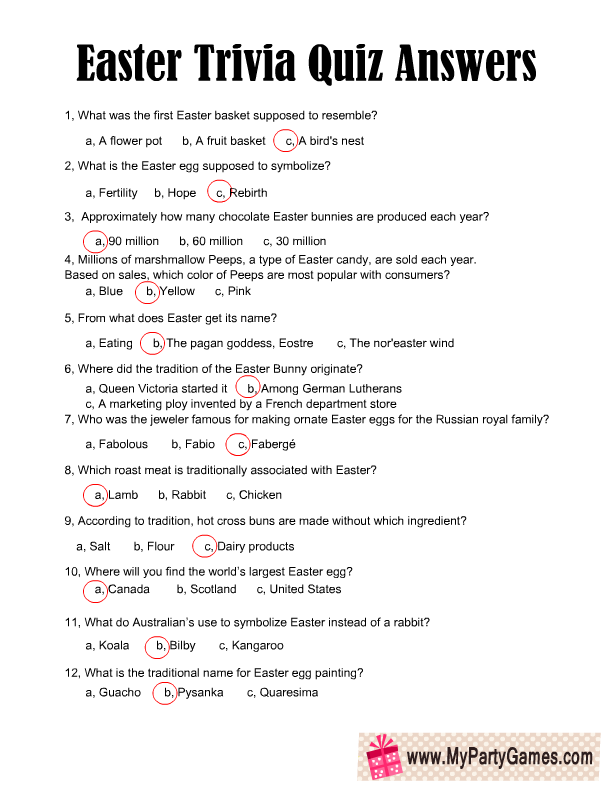 Print a copy of the answer key to this quiz. Check the answers given by all the players. The player with most correct answers will be the winner. 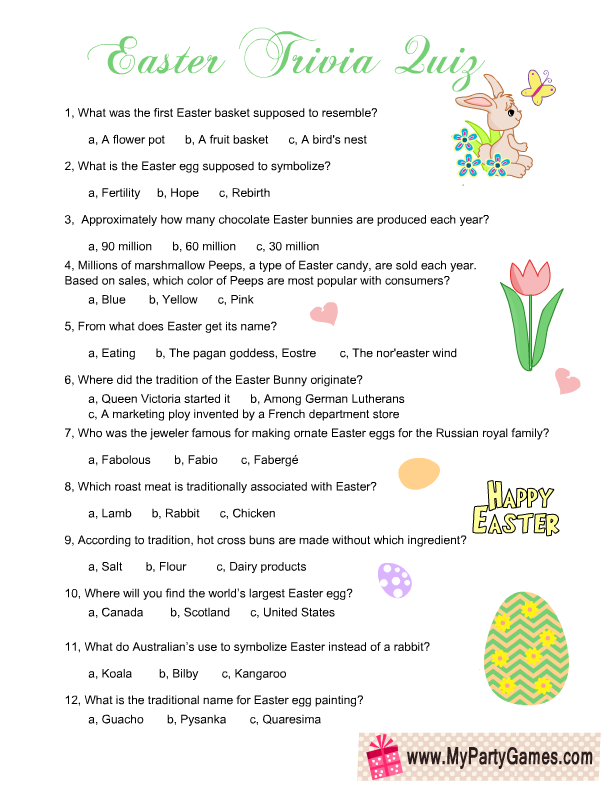 This is the first free printable worksheet of this Easter trivia quiz. Just click on this thumbnail image and a bigger printable sheet will open up. You can save it or print it right away. 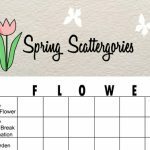 This game quiz worksheet is decorated with a border of colorful tulips. 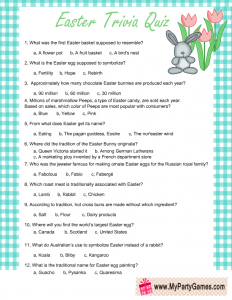 This is another free printable worksheet of this Easter quiz. 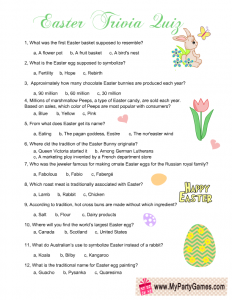 This quiz sheet is decorated with colorful Easter objects like flowers, eggs, and an Easter bunny. Just click on the thumbnail and a bigger image will open up. You can save or print it. 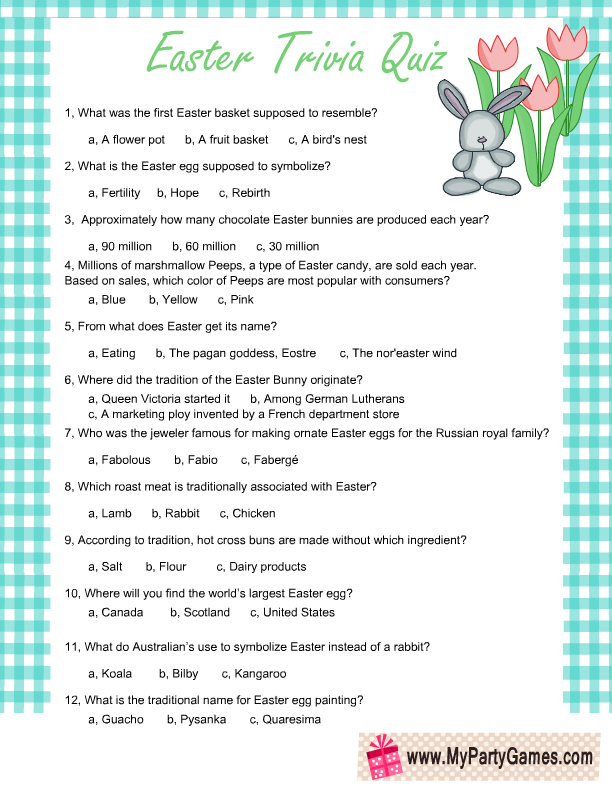 This is another free printable worksheet for this Easter Trivia Quiz. 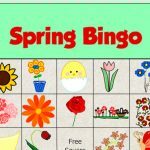 This game sheet is decorated with a colorful border, Easter bunny and Tulips. You can save and print this image following the same method as I have mentioned above. 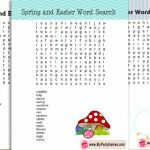 Here is a free printable answer key to this quiz. Just click on the thumbnail and a bigger printable image will open up that you can save or print. 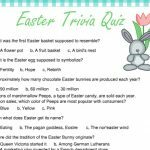 I couldn’t find many other free printable Easter Trivia Quizzes for you but there are many websites that offer Easter Trivia Questions and answers where you can self test your knowledge. 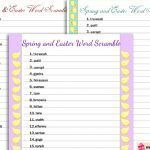 A fun site to test your own knowledge about Easter. The answers will be revealed when you will click the question mark image besides each question. 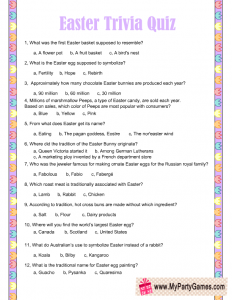 Multiple choice Easter Trivia Q and A for kids. 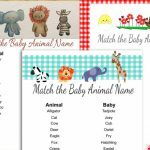 This site offers a free printable Trivia Quiz in PDF format and also an answer key to this quiz.